This same site has a written explanation of the criteria used to determine overall street condition: pavement condition (PCI), curb and gutter, drainage, ADA (American Disability Act) requirements, and underground utilities. It also states, “The SPMP is for applying preventative maintenance to streets that are still in Good condition. It is not designed to fund reconstruction of those streets that are in POOR condition. 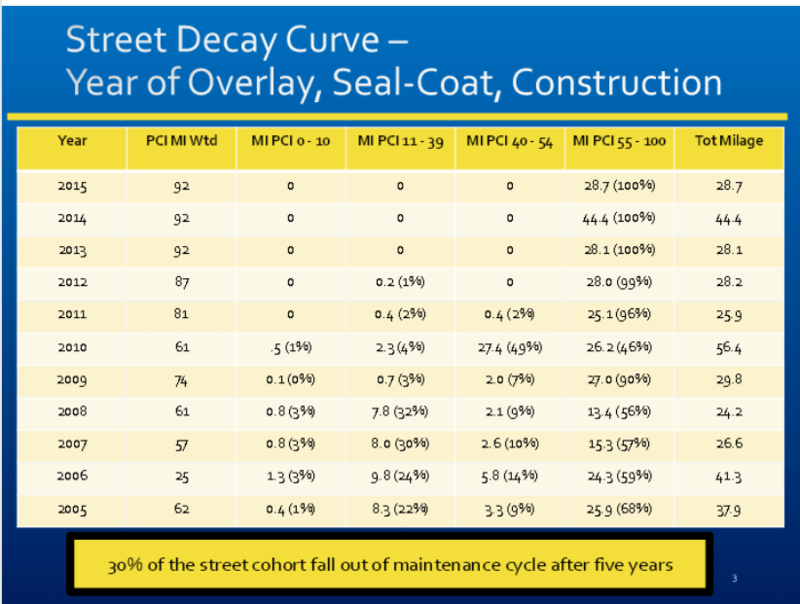 Streets with a PCI in the range of 56 to 100 are considered to be in Fair to Good condition and are candidates for preventative maintenance, which includes seal coats or overlays.” Seal Coating adds a wear surface that lasts up to 7 years, while overlays can last up to 10 years. 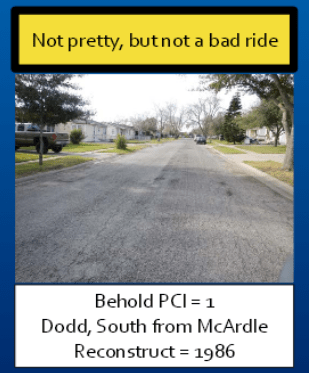 A street with a PCI of 17, such as the one depicted in the photos below, is obviously in need of something more drastic than a seal coat or overlay. Unfortunately, that requires a completely different kind of repair, such as full reconstruction, which is typically funded by a bond. 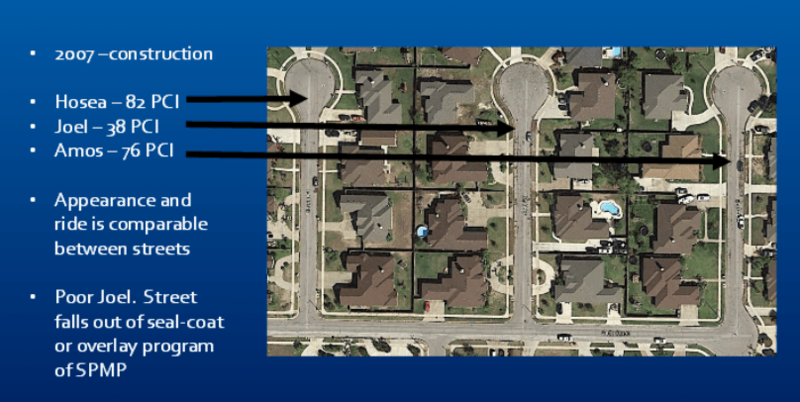 Two of the ad hoc street committee members, Andy Taubman and Kyle Pape, took a drive around town to get a real look at the residential streets. What they found was rather revealing. For example, they discovered that PCI varied greatly even for similarly situated streets. Hosea, Joel, and Amos were built in 2007 and have basically the same kind of traffic, yet their PCI ratings vary greatly, especially Joel’s. 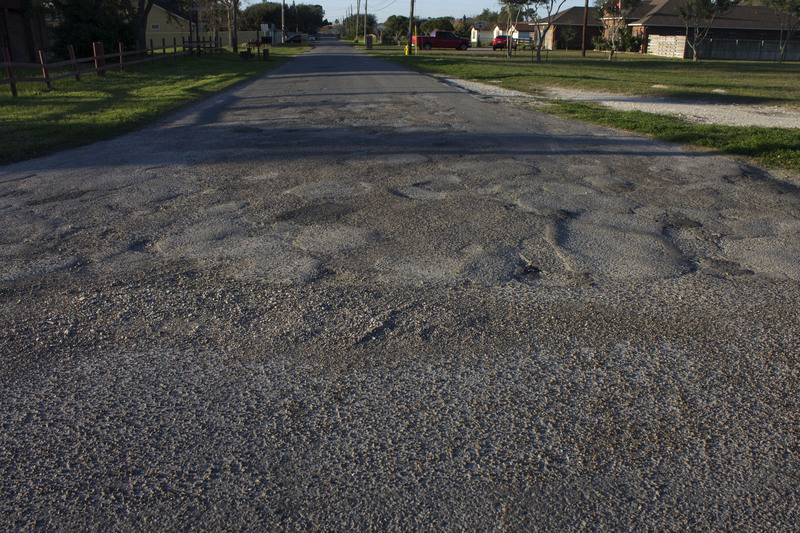 They also found that streets classified as “failing” are actually stable, such as Vista Ridge Drive in the Calallen area, and may deserve a higher rating. Furthermore, though some streets have lots of alligator cracks and a PCI of 1, as is the case with Dodd, the ride itself is not bad. The road is just ugly. Some roads Taubman and Pape found to be dangerous. These streets had more than just potholes. Some, such as Yorktown Boulevard at Rodd Field and Hearn Road looking east at Callicoatte Road, have a bad case of “right lane sag” which creates a sensation in the driver of running off the road because the car pulls to the right. Other roads have jarring dips, as on Orlando Street. This condition has the potential to damage a car, which can cause anxiety in drivers. Other streets have holes or washed out areas at the turn edge. The northeast corner of McClendon at Staples has just such a problem, which could also cause damage to vehicles. Still other roads are simply too narrow for two vehicles and oftentimes are without shoulders. At night, this kind of road (i.e. Don Patricio in Flour Bluff) gives the driver the feeling that oncoming vehicles are approaching them head on. These kinds of conditions do not figure into the PCI, but they do figure into what some might call the OSI (Oh, S#*@! Index). After examining the PCI data provided by city staff and then actually cruising the streets of Corpus Christi, Taubman and Pape put together a presentation for the Street Committee that outlined their findings. First, streets with a PCI of 0 to 10 do not necessarily drive worse than streets with a PCI less than 55. Second, actual ride quality is mostly independent of PCI and does not take into consideration dangerous situations. Third, some seal-coat roads that have a high PCI may actually produce a poor ride. Fourth, citizens don’t care as much about alligator cracking as they do hazardous driving conditions. Last, maybe the City should consider that PCI is not the best management objective and consider devising a better plan for prioritizing the streets slated for maintenance – with safety concerns topping the list. 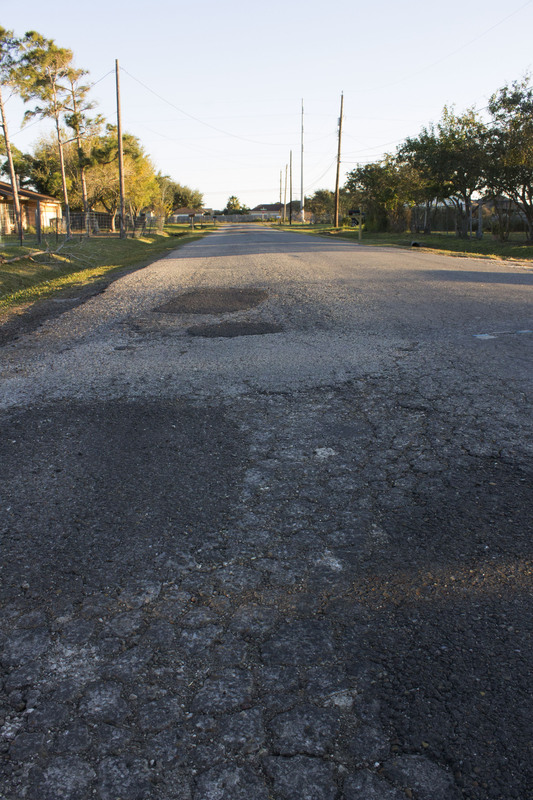 By doing so, they can spend the allotted street maintenance funds more efficiently and actually address streets that the citizens know are in dire need of repair. The Street Committee also reviewed if the City was getting its moneys-worth from the seal coat and overlay programs. The City does these treatments to preserve the life of streets that are in good condition and uses the street fee added to everyone’s water bill to do them. The review consisted of looking at the road quality to see if the treatments had protected the roads as expected over time. What the Committee found is that it appeared that seal coats were not as effective as planned. Overlays did not have enough history to provide definitive results, but the small data set did not inspire confidence of maintained quality either. The City cites many reasons why this occurred and hopes to improve the process going forward. The Committee recommends that this analysis continue to see if the situation improves or stays the same. ← Does Anyone Really Know What “Uber” Means?